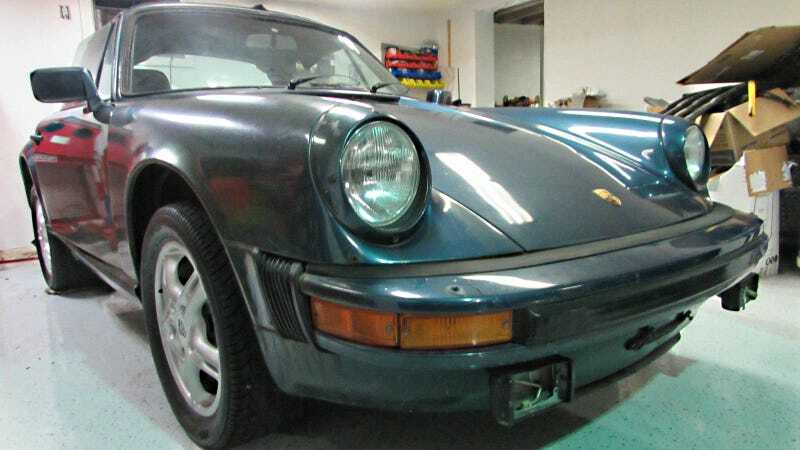 If you've been in possession of a more-or-less reliable pulse for the last few years and have glanced at the used car market at least once, you'd have figured out that the one car to get is a vintage Porsche 911 like this project SC Targa. Now's your chance to roll up your sleeves and buy one of your very own for next to nothing. This 1980 Porsche 911 SC Targa was, in its day, a capable sports car. Its 3 liter 6-cylinder, air-cooled boxer engine and 5-speed transmission was good for 188 horsepower and a 0-60 time of pretty good. It was still in the era of pants-crappingly horrifying lift-off oversteer, but the car was a great handling example when given to someone that knew its unique quirks. This car is a definite project, but seems to be complete with engine and transmission, which looks to be out of the vehicle at the moment. With prices increasing daily, you'd be hard pressed to find anything close to this numbers-matching value in the marketplace. It would need some interior panels refurbished, as well as some mechanical parts replaced, but it's certainly worth saving. I'm all for projects, and this one seems like a great opportunity to start your classic car collection for Nissan Versa money. With the market demand skyrocketing lately, holding on to this car would literally pay dividends. You'd essentially buy this car, put it together, and get paid to wait - an awesome deal for anyone with some spare cash burning a hole in their bank account. Get it before I figure out how to bring it home. Is This Ridiculously Cheap Toyota Supra Worth Saving?